Listen up. I know full well that there are people who claim to be Christians, but they live like the devil. (I have serious doubts that they ever were Christians, 1 John 2.19, Matthew 7.20-21.) For that matter, one reason that I went away from my faith for several years was because of false or nominal Christians, but never mind about that now. Like any group, there are members that do not uphold the beliefs and principles of that group. Especially if it's a large one. Seems to me that it has something to do with a simple problem, that of being human. I'm saying this at the outset because there are people who will look for any excuse to negate Christianity, Christians, the Bible and God himself. You know the type: "I knew a guy that went to church and said he was a Christian, and he was caught stealing money". So? That means he had problems, not that God is fake. The exception does not invalidate the whole, and the exception does not become the rule. I think I've covered the people that look for excuses to disbelieve. Now, on with what I really want to say. God is in the business of changing lives, and his people are supposed to be going about their business of proclaiming the gospel so those lives can be changed. The short form is that if you humble yourself, admit that you have sinned, confess your sins and repent (turn away) from them, making Jesus the Lord of your life, you will be saved. And "saved" means that you will no longer be in danger of getting the justice you deserve in Hell. Instead, your place in Heaven is assured. You will become a child of God, adopted into his family. None of this "I believe" intellectual assent nonsense. I'm not trying to just convince you of something, I'm trying to show you that you need to be committed to Christ so your heart can be changed and settle your eternal destination. Even better, you will be transformed and become a new creation. As you grow in him, those rotten things you used to take delight in doing will lose their appeal, and their grip on enslaving you will be loosened. You life on earth can change if you let God have his way with you. If you want to discuss these things further, feel free to write to me, or use the links ("How to Get to Heaven" and "The Romans Road" links at the top right side of the page, and the "Good Person Test" in the right column). John Schlitt was in the group Head East. He became such a druggie that he was a detriment to the band and got himself thrown out. Jesus made something of his life, and he became a minister by being the lead singer for the Christian rock band Petra (one video is here). I hope his story will speak to you. Buona sera. Decisions, decisions. Take the day off from this Weblog and work on another one that's overdue, post something very important, do something silly here — nah. I'll continue in a similar vein from yesterday's lessons in logic. Why can't people learn to think? But first, I'll mention that the atheists in both of yesterday's examples refuse to admit error. That happens frequently, probably because they hate Christians so much, we cannot be allowed to be right, and God forbid (heh! ), they cannot be wrong. (Just ask Norman. I'm wrong or lying, and he's right. Just ask him.) It's against the atheist code for an Xtian to be right, you betcha. If I don't get this back, I will know you really didn't read it. You know that I didn't read it how? If you don't get this back, all you know is that you didn't get it back. Don't go putting an argument from silence on it. Too bad that the person who sent it to me did not know 10 people who would admit to knowing the Lord. Some people needs lessons in thinking. 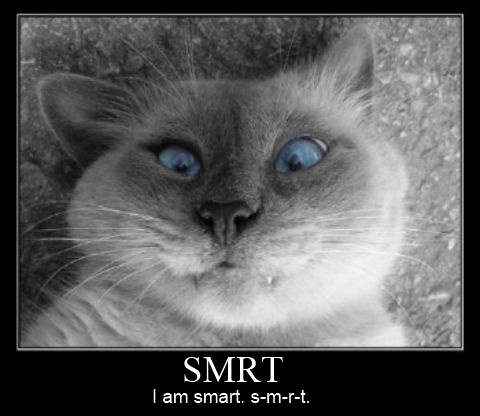 Probably a product of American public schools. First, STOP SHOUTING! Second, what if I'm busy or just don't feel like obeying your conditions? What miracle is that, Poindexter? Will AOL and Bill Gates share their fortune? No, that's a different e-mail. This one is worse, it turns the gospel of Christ into a superstition or wish fest. But also, it is a great demonstration of bad logic. Saint Theresa is known as the Saint of the Little Ways, meaning she believed in doing the little things in life well and with great love. She is represented by roses. May everyone who receives this message be blessed. Theresa 's Prayer cannot be deleted. Sorry you have to forward the message, but try not to break this, please. Sorry, Selma, but this is too close to pagan superstition to please me, and degrading to the true gospel. I hate it when "believers" act like that. If anyone wants to pass along something nice, then do it without the conditions or demands. And especially without the superstitions, capice? This will have two examples. First, I was in an altercation with some vicious trolls on Twitter on Christmas the day after Christmas (and I seldom use Twitter these days, as I have said before). Mixed in with those were some who wanted to have a detailed intellectual discussion (a bad idea on Twitter, which is designed to limit you to 140 characters). One made the outlandish statement that "animals are born atheists". Anyone who is capable of rational thought and is not brainwashed by propaganda can easily see the absurdity of that remark. And, it seems, so can the OP, because his comment appears to have been deleted. That's right, Buttercup, I called you on it. You made a statement that is nothing but faith — no, it is nothing but wishful thinking for your position, and I didn't let it fly. No, it does not mean that. This is a faulty premise as well as rushing to a conclusion and skipping many steps. 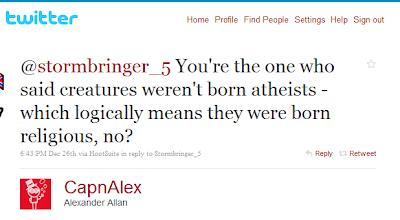 I do not want to pick on this Alex, but I think he is showing the faulty reasoning that the others used as an excuse for venomous personal attacks. Note that they were happy engaged in deriding the Xtian, and yet, they did not have evidence for their claims! 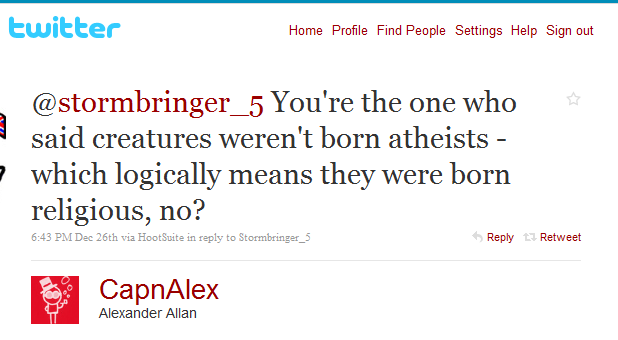 I simply said that they cannot prove that animals are born as atheists. See what I mean, that hate stupidifies people? By the way, note that he capitalizes atheist, but refuses to capitalize the names of other religions. For that matter, this "discussion" came about because of the article I posted asking the question, "Does Atheism Cause Brain Damage?" If you go on Twitter and read the vicious, hateful, profane rants of "theealex" (and possibly "Chaotic Neurons" as well), you will see that they may very well have answered my question in the affirmative. Further research is in order. Wait, I do have some further research! Remember, I did say that I have two examples. Here is the second one. I made a statement at Atheist Central (the link is furnished if you want to read everything in its entirely, but I think the highlights cover the matter well enough) that, "I know it infuriates you that many atheists have not only come to Christ, but are experts in defending the faith against the unknowing and poor thinking God haters." So, Captain Howdy steps up. (By the way, what is it with atheists and military ranks?) Cap'n demands, "Name one Christian on this entire blog that started out on this blog as a professing atheist and has since been converted by Ray's arguments. Just name one, Stormbringer." Edit: This is a Straw Man fallacy, as well as an argument from silence. My response: "Why should I? You are changing the discussion. Hey, here's an idea: Let people speak for themselves, since I do not know the heart and soul of everyone who has posted here since this Weblog's inception." Remember, I said that I knew of atheists who became Christians and defenders of the faith. I did not say that I knew of them on Ray Comfort's Weblog. Some other resident hateful types chimed in, but because they have demonstrated their viciousness as well as irrationality in the past, I ignored them. This appears out of sequence on the Weblog, but Cap said, "Just what I thought." Edit: Argument from Silence fallacy in its full glory. So, my refusal to let him change the rules in the middle of the discussion, and not fall for his bait, is proof that I am wrong? Cafone. Cap also stated, "Well how about because your entire argument was based upon the idea that these people exist. Now you are saying that you don't actually know if any of these people exist, which invalidates your entire argument." Edit: Another Straw Man. He had some other stuff that was not worth quoting. At the conclusion of my reply to this (I mentioned the first example of bad logic, shown above), I stated, "In both your case and his, putting words in my mouth, then saying that my argument is invalid, is, frankly, a lie. Where do people like you learn logic?" He has not replied. I am not going to be like these people and conclude that his lack of reply has any meaning, however. He may be replying right this minute, in two weeks (I will not be checking back), or not at all. Not than any excuse for putting words in my mouth will matter, nor will this demonstration of horrible logic lose its merit if he does reply. So, if someone insists that Christians are inherently stupid (conveniently ignoring the great intellectuals and scientists of the past and present, by the way), it is best to use actual logic. Excuses for hate and ridicule are not logic, capice? See Romans 1.19-22. If I'm wrong about something, fine. But don't lie about others to build up your own fragile ego.